Average Height	: 12" - 16"
It is believed that the Swedish Vallhund may well be related to the Cardigan Welsh Corgi and the Pembroke Welsh Corgi. The breed was brought to Wales by the Vikings in the 800s. The Vikings knew the dog as the "Vikingarnas Hund," which meant the "Viking Dog." "Vallhund" means "herding dog." Some of the breed’s talents are cattle drover, watchdog and ratter. The dog is becoming more popular at European exhibitions. 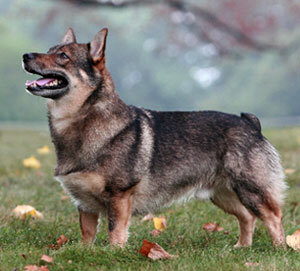 The Swedish Vallhund was only recently recognized by the AKC in 2007. The Swedish Vallhund is a responsive and even-tempered great dog. They are intelligent and affectionate and love attention and instinctually craves leadership. Owners are never disappointed in his multi-faceted ability or his spontaneous sense of humor. Extremely active and devoted little dog. Be sure you are this dog's pack leader to avoid Small Dog Syndrome, human induced behaviors where the dog believes he is above humans in the pack order. Dogs that do not clearly know their place in the pack can be untrustworthy with children, may begin to guard, bark obsessively, become wary of strangers, and be dog aggressive with other dominant dogs. Properly socialize this dog, providing rules he must follow, and limits as to what he can and cannot do, in order to avoid overprotective behaviors. These dogs sometimes try to herd people by nipping at their heels, although they can be trained not to do this. The Swedish Vallhund makes a good alarm dog, but should be told to quiet down after it has already given off its warning bark. This breed makes a great companion and can be used for herding and ratting. They also make excellent show and obedience dogs.